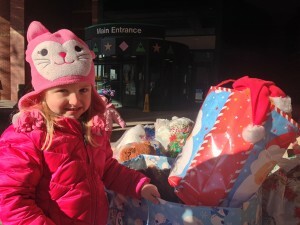 3-year-old Charlee helps her mom, Amy Wise, unload the teddy bears. It took several minivans and even a KinderCare bus to deliver all of the donations collected during KinderCare’s community teddy bear drive last week. According to Amber Bowling, district manager at KinderCare, the 27 regional child care centers collected 3,750 bears, thanks in part to WEWS Channel 5 spreading the word about the details of the drive. The 1,500 bears donated to Akron Children’s Hospital were collected at 10 local sites, including Richfield, Canton, North Canton, Barberton, Cuyahoga Falls, Green, Fairlawn, Wadsworth and Medina. The rest of the bears will be distributed to patients at the Cleveland Clinic. The idea for the drive was conceived last year by a Mentor teacher who had a hospitalized child over the holidays. The Mentor location was able to collect 250 bears and a lot of good will. 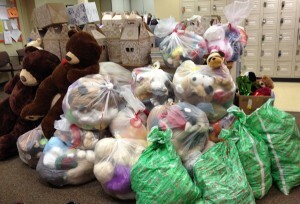 Inspired by the success of last year’s drive, KinderCare decided to collect bears at all the locations this year. Brandi Bowers, manager of the Richfield facility, said the drive fills a need. She said the teachers role play with the kids to help them understand the meaning of the donations. Amy Wise, assistant director of the North Canton location, knows from experience how much a cuddly friend can mean to a hospitalized child. Her 2 daughters have been patients at Akron Children’s several times for surgeries ranging from diaphragmatic hernia repairs and open heart surgery to ear tubes and tonsillectomies. Gerri Sexton, volunteer coordinator at Akron Children’s Hospital, was moved to tears by the volume of the donation. She and her staff needed 4 large linen carts to haul the donations to the volunteer department. Bowers said to expect even more bears next year.